Deciding between working in a small firm versus a big firm is always a difficult choice, especially when we only have experience in one and not really sure how the other one works. How do you know if you should make the switch? 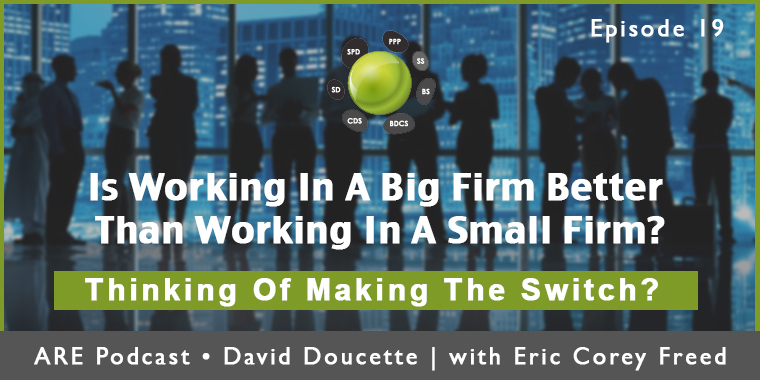 In this episode, we discuss an overview of life in a big firm and compare the experience to working in a small firm. We also discuss the advantage and disadvantages of each. If you’re curious about what the culture is like or thinking about making the switch, this episode is for you! you may not get to see the entire project all of the way through. more departments, more bureaucracy, more pigeonholing. little transparency in the future of the firm – you don’t know where projects or people come from. Which firm type do you have experience working in? Let us know in the comments below.